Swatch Attack! 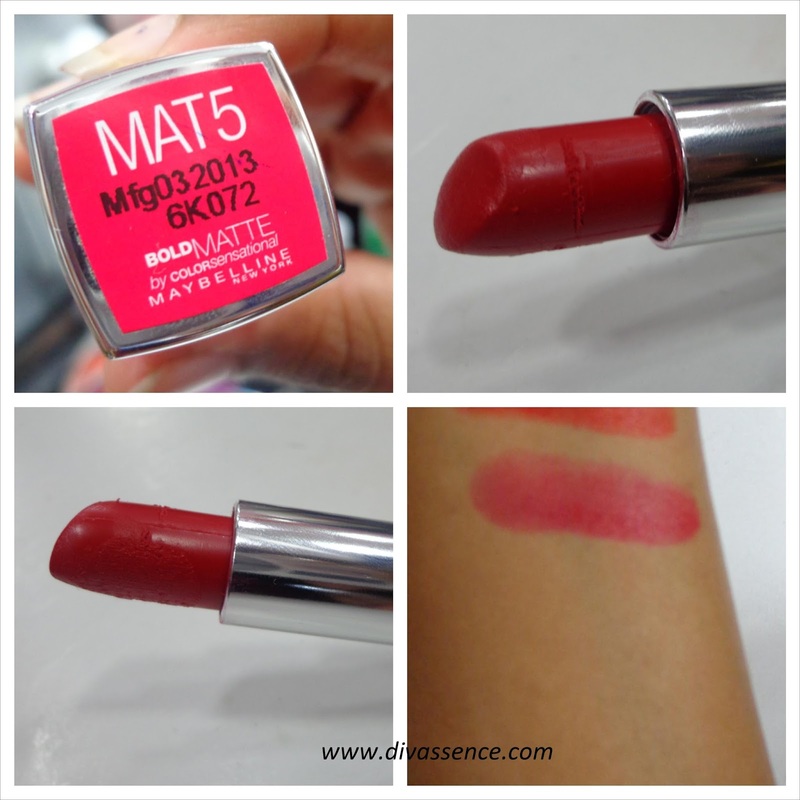 : 5 Maybelline Bold Matte Lipsticks (And first impressions!) - Divassence! How is this month so far ?? It was bold and beautiful for me. And I went out to the Maybelline Counter in the nearby H&G store and I found these. There were a few people who have bought this. But I thought of compiling a post just to show you swatches of the these beauties in case you want to buy them. MAT1: This one below is MAT1. A bold blue based peony color which photographs light fuchsia under yellow light. 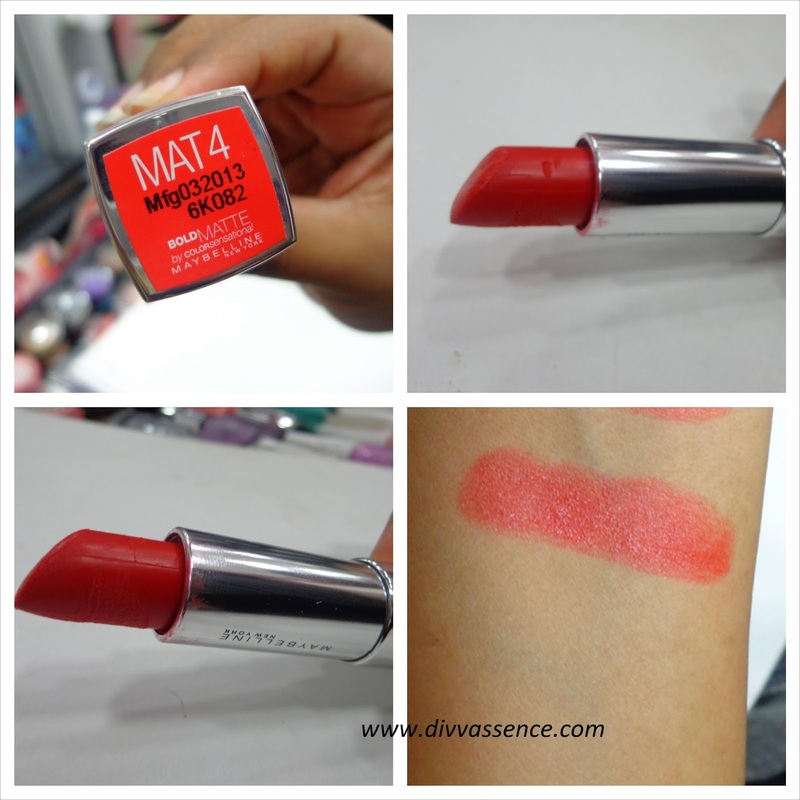 Peeps who are below NC40 in MAC will rock this shade all the way to MARS. MAT2: Nice !!! This is an orange based red. Looks intense and I love the finish. This is an absolute stunner. I am planning to pick this one. 🙂 😉 The below swatch is a single swipe and so you know how crazy pigmented this is. Go for it girls and rock that evening party !!! MAT3: This was a real disappointment for me. It is a sheer orange color. The swatch is visible only after multiple swipes from the tube. 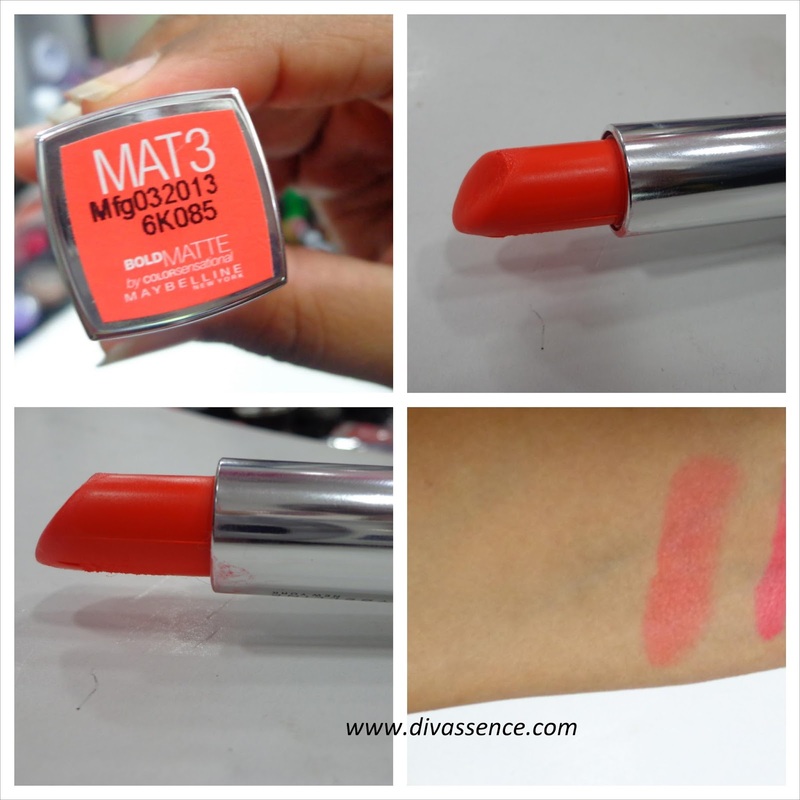 MAT4: Its a red based orange. Looks wearable and will suit the Indian Olive complexion beautifully. So you ask me what is the difference between MAT2 and this one ?? Simple. This one leans towards to orange while MAT2 tends towards red. MAT5: Woohooo!!! Pink based red. This one is so beautiful, so so beautiful … I was staring at it all the while, when I was taking photos. 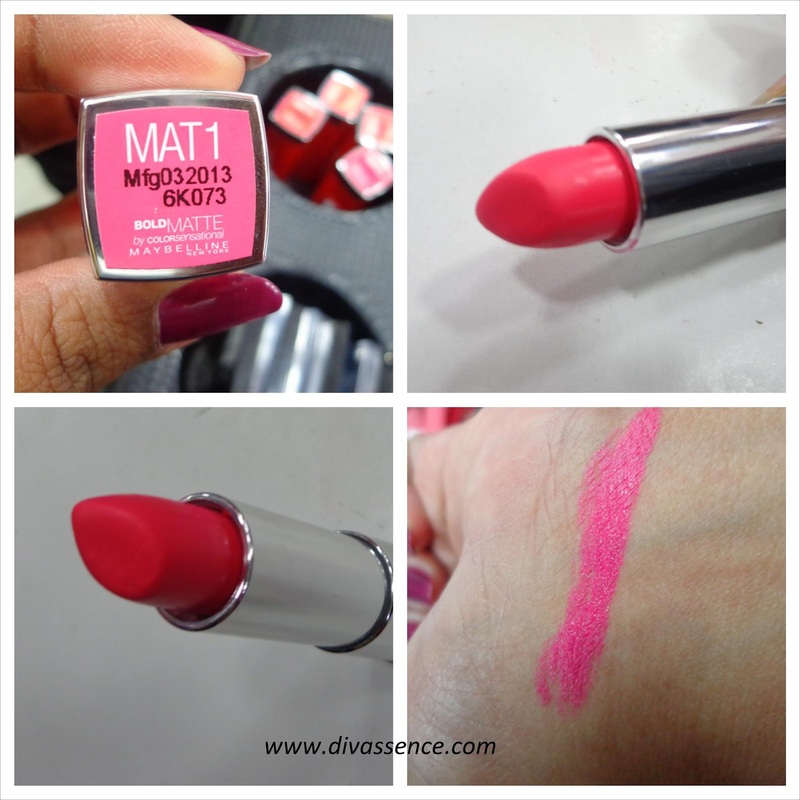 This is bold, creamy (matte ?? Where !!!) and lovely to wear. Finally I am leaving you with all the swatches together. I am literally pondering over MAT2 or MAT5. Which is your pick ?? Tell us. donno if i wil pick one…. I have mat 2..mat 5 is prettyyy.. Thank you ladies !! Hope they were helpful !! Lol 😀 it rhymed!! Couldn’t resist!! I bought MAT 3. 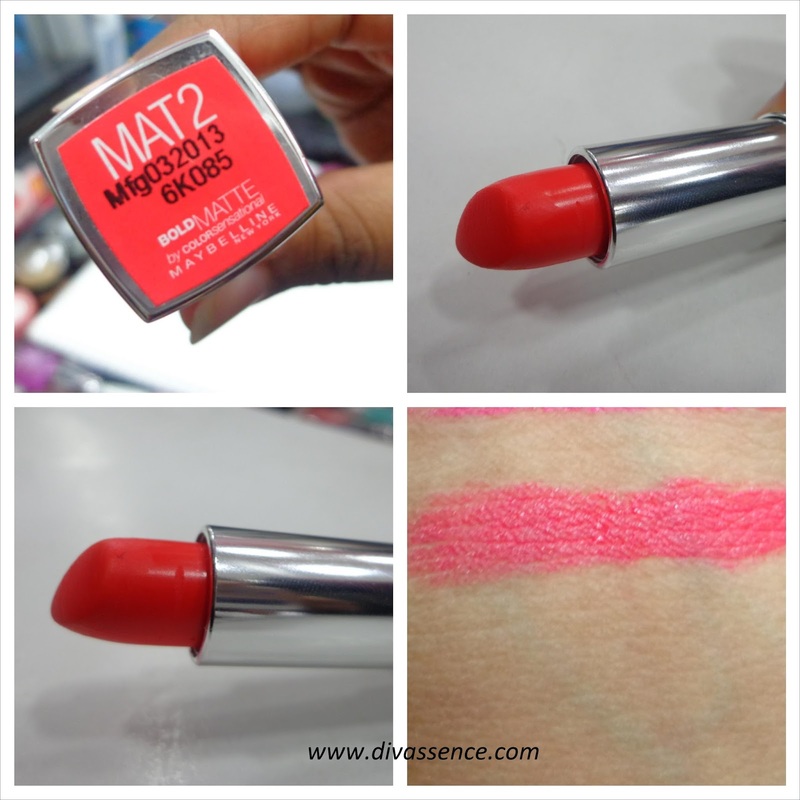 It certainly is a very sheer shade, but i love the orange tint it gives to my lips. i’m so confused, i like all the colors! Sounds lovely! Will be getting the MAT 2.